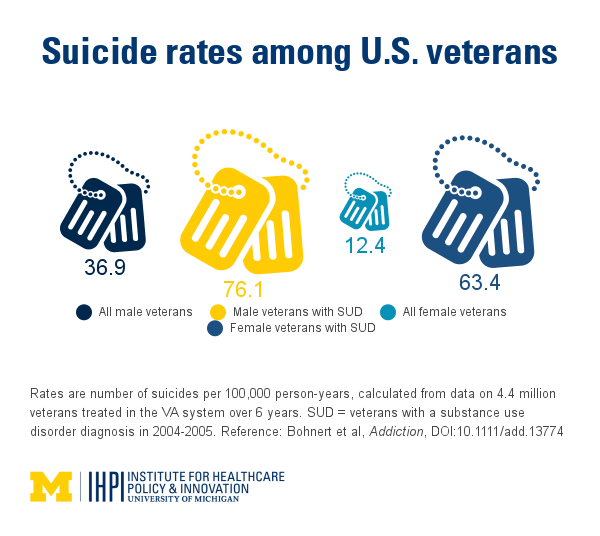 Rates of suicide for veterans, calculated by a University of Michigan/VA team based on data from 4.4 million veterans over 6 years. Newswise — ANN ARBOR, MI – Veterans who have drug or alcohol problems are more than twice as likely to die by suicide as their comrades, a new study finds. And women veterans with substance use disorders have an even higher rate of suicide — more than five times that of their peers, the research shows. The risk of suicide differs depending on the type of substance the veteran has problems with, according to the study. The highest suicide risks are among those who misuse prescription sedative medicines, such as tranquilizers. Women veterans who misuse opioid drugs also have an especially high risk of suicide, the study finds. The research, published in the journal Addiction by a team from the University of Michigan and Department of Veterans Affairs, finds that much of the difference in suicide risks might be explained by veterans who have both mental health conditions and substance use issues. But they say the new findings point to a need to focus more veteran suicide-prevention efforts on those who have substance use disorders, especially if they also have depression, schizophrenia, bipolar disorder, post-traumatic stress disorder or anxiety. The new findings come from one of the largest-ever examinations of substance use disorders and suicide, involving more than 4.4 million veterans. Twenty veterans die by suicide each day – a much higher rate than in the general population. Because two-thirds of the suicides in the study involved firearms, the researchers also note that firearm safety is important in efforts to reduce the toll of suicide on those who have served the nation. In addition, one-quarter of suicides among veterans with substance use disorders were by intentional poisoning, highlighting the need for strategies to prevent that form of suicide in this group. The researchers say their work may have implications for the civilian population as well, but that it’s harder to study individuals outside the VA in the same way because records aren’t centralized like they are at the VA.
Bohnert and his colleagues from the Department of Veterans Affairs, U-M Addiction Center and U-M Institute for Healthcare Policy and Innovation looked at VA records from a large group of veterans who saw a VA provider in 2004 and 2005. They then tracked suicides among this group over the next six years. In all, 8.3 percent of men and 3.4 percent of women in the cohort had a substance use disorder recorded in their list of diagnoses in 2004-2005. And 9,087 of the veterans in the study group died by suicide during the follow-up years. 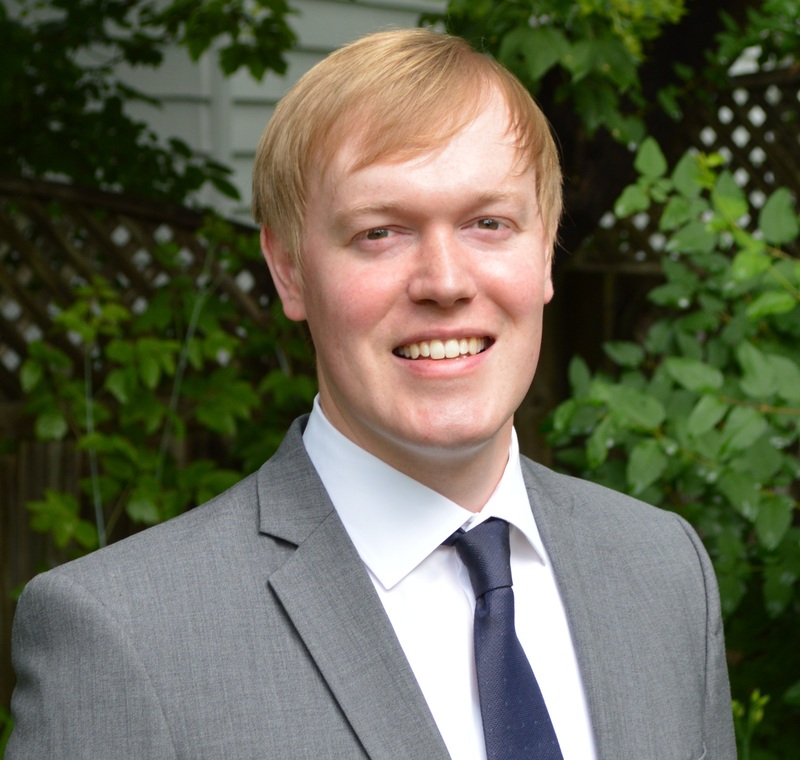 Using statistical techniques, the team calculated suicide rates per 100,000 person-years, and then calculated those rates for veterans with substance use issues overall, and for specific substance use disorders. In all, the suicide rate was 75.6 for veterans with any substance use disorder, compared with 34.7 for veterans overall. A previous study led by Mark Ilgen, Ph.D., co-author on the new study, found similarly higher rates in veterans who were tracked from 1999 to 2006. But the new study lets the researchers drill down to the specific substance that veterans had problems with, including alcohol, opioids, marijuana, and cocaine. The study found the suicide risk was highest for veterans of both genders who misused sedatives – 171.4 per 100,000 person-years – and markedly higher for women who misused opioids, at 98.6 per 100,000 person-years. The researchers couldn’t distinguish between misuse of prescription opioids and problems with other non-prescription opioids, such as heroin. Men who misused amphetamines also had a suicide rate of 95 per 100,000 person-years. The study couldn’t tell whether they were misusing prescription amphetamines, such as those used for attention deficit disorder, or using illicit drugs such as methamphetamine. The researchers then took into account veterans’ age and the overall severity of their medical conditions, and calculated the risk of suicide by type of substance use disorder. This reduced the size of the difference in suicide risks somewhat but most of the original relationships remained. When the researchers factored in mental health diagnoses, the picture changed. Among women, only alcohol and opioid disorders remained associated with higher suicide risk, independent of mental and physical health. Differences between men and women diminished as well. But both genders with substance use disorders had a higher rate of suicide even after differences in physical and mental health were factored in. In addition to Bohnert and Ilgen, the study was conducted by Samantha Louzon and John F. McCarthy, Ph.D., of the VA Serious Mental Illness Treatment Resource and Education Center, and Ira R. Katz of the VA Office of Mental Health Services. The study was funded by the Department of Veterans Affairs. Reference: Addiction, Early View, doi:10.1111/add.13774 Veterans in crisis should call the Veterans Crisis Line at 800-273-8255 (press 1), or text 838255.